As I approached this past weekend I was tired. Like exhausted. We had a terribly busy week, Dominic had been on the road for 3 days so I was doing the single parent routine. And every moment that Dominic was home seemed stressed to get things done that we needed to do. I felt like the kids had suffered from our crazy schedule and there were still so many things on our home to-do list. A few weeks ago I purchased a ticket to the Beth Moore Simulcast that a local church was hosting. Several women from my old Bible Study were attending and I wanted to be there. It was the first time since they started hosting this simulcast that I actually bought a ticket and planned to go. But after our week I found myself questioning if I should go or not. It was only a $10 ticket, but I had committed to going. I didn’t want to let anyone down…and yet I felt strongly that I needed to spend the time at home. Late Friday night I made the decision that I wasn’t going to go. There was a project at home that needed my attention…even more than my need for spiritual teaching from Beth Moore. Saturday was busy, and not really restful, but it was good. Our 3 youngest kids have been sharing a room since Isaac left for college. It is a large space so that wasn’t the issue…but Gabe was getting frustrated with the little’s inability to pick up their messes. He wanted his own space. A place that could be his, and clean! So we worked on getting Gabe’s old room back into his new room. And then, in the big room is a large closet. Elijah has been asking for a “special space” that would be his own for 2 years now. With Gabe’s help we pulled out everything from that large closet and spent the day purging, cleaning and sorting so that storage could be in one part of the closet and a special space was created in the other. Bean bag chairs and curtains finished off the space and the littles squealed with delight when they saw the finished space. As I was tucking them in for bed they said that they appreciated all my hard work and loved their new space. I realized that I was just where I needed to be that day. So I posted a status update on FB about my day and how it had all worked out, and then forgot about it. At church on Sunday a friend found me and thanked me for what I shared. She too had struggled with whether she should attend the simulcast or not and chose her family instead. She was questioning her choice a little but then saw my post about staying home and it was just what she needed. She said that it is good when we share the honest looks at our life because we never know who might need to read them. Isn’t that the truth?! It is one of the reasons I blog…typically I have a “failure” type of story to share…how I did it wrong, so learn from me kind of wisdom. And I do that because for SO LONG I felt alone. Isolated and certain that everyone else had this life figured out and somehow I had missed the memo on how to get there. We need to encourage one another, tell the truths that our hearts are longing to hear! 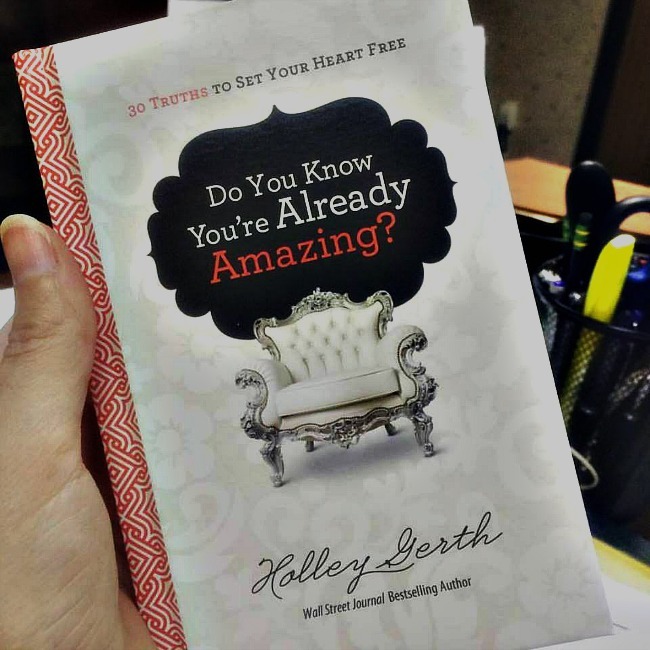 My dear friend Holley Gerth has written a new devotional called “Do You Know You’re Already Amazing” – 30 Truths to set your heart free. If you have ever read any of Holley’s books or blog posts you will know she writes as though she is sitting across from you, sharing life. As a woman who has struggled with knowing who God created her to be, Holley understands the unique way that women need to be encouraged. In person, she is an embodiment of grace and kindness, she is a true gift. Those sections at the end are called “Truth for your Heart.” Because Holley recognizes that so often we fill our thoughts and our hearts with lies and then we get stuck. In these places we can search our hearts for any lies we may be holding on to and humbly ask God for the wisdom and clarity we need to move forward in freedom. Oh friends, it is good stuff!! So as you start this new week I encourage you to be real with one another, drop the guilt you may be carrying and equip yourself with some truth and encouragement for your journey by picking up a copy of this book! This entry was posted in Book review and tagged #AlreadyAmazing, Truth for your Heart on September 20, 2016 by Kristin.